amie McDonagh of Derry City, left, is ushered from the field by team-mate Patrick McClean after being sent off in Tallaght. JAMIE McDONAGH admits he made a 'stupid mistake' which resulted in a four match ban but the winger wants to put the frustrations of the last six weeks firmly behind him. 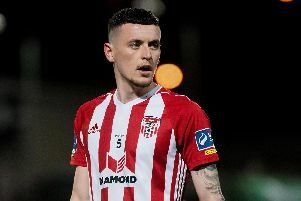 McDonagh made his long awaited return to action in the EA Sports Cup second round victory over Longford Town on Tuesday night - his first appearance since making an ill-judged lunging tackle on Shamrock Rovers defender, Trevor Clarke on February 22nd in Tallaght. It's been six long weeks on the sidelines as he served his ban while the international break didn't make things any easier for the Lisburn lad. The suspension was deemed as being 'ludicrous' by City boss, Declan Devine at the time and McDonagh agrees the punishment didn't quite fit the crime. However, he's had plenty of thinking time and insists he's learned valuable lessons about the incident as he spoke publicly about his frustrations for the first time, promising he'll think twice before lashing out again. "It took a couple of days for it to kick in, the actual ban when I found out it was four games," explained McDonagh who made a hugely impressive return to action in midweek. "And then with the game (St Patrick's Athletic match) getting called off due to internationals it was even more frustrating as it meant an extra week. "So it was a total of six weeks. When it came to all the home games I was sitting in the stands and I was itching to get out on the pitch. Every day in training I try my hardest and try to stay fit but it's different when you know you can't play. Whereas if you're injured you're not actually out there. When you train every day you just want to get to the end of the week and play a game which I couldn't do. "I'm happy it's over now and hopefully I don't make a stupid mistake like that again." Recalling the incident, McDonagh claims he acted out of frustrations but felt he needed to move on and concentrate on the rest of the season. "I've watched it back a number of times. I've tackled the Rovers player and got up. My mind was already made up that I was going to slide tackle him but he just nipped in front of me and I swung very hard at him. I think it was a bit of frustration. From my point of view I think it was harsh but it's done now. "I need to move on from it very quickly. I can't let my teammates or my manager down like that again. I put myself in a position where I couldn't play for six weeks and the manager doesn't have the option to have me in and around the squad. So I will definitely learn from it and hopefully it won't happen again." McDonagh returns to the squad at the best possible time for Devine given the current injury list and the hectic fixture schedule. The 90 minutes he played on Tuesday night against First Division outfit, Longford will have done him the world of good and he was delighted to get back out on the pitch. "I think I've come back at a good time because there's a lot of games coming up. I know he'll use the squad wisely and will use people when he thinks they're needed. It's not just the case of using the same starting XI every week." Playing at right wing-back against Longford on Tuesday night, McDonagh did well and sent in a superb cross for Junior Ogedi-Uzokwe's opening goal in the first half - a glimpse of what he can produce in the final third. His return gives Devine another option and McDonagh agrees all those who have been on the fringes of the squad for the past few weeks will be fighting for their chance to play in Friday night's crunch North West derby clash against Finn Harps at Ballybofey. "The good thing about the changes the manager made against Longford was it gave everyone a chance to show what they can do for the game on Friday. It's going to be a very tough, physical game. There's a lot of rivalry between the two clubs so we'll be raring to go on Friday night. "When it comes to playing Derry they will be psyched up for it more than any other game. That's natural but we've got to play our own game and match them physically and see if we can pass the ball better than them and match them all over the pitch and hopefully we can get the three points." McDonagh was the only player who started Tuesday night's cup match remaining from the team which started the EA Sports Cup Final against Cobh Ramblers last year, although Eoin Toal and Shane McNamee both started the decider on the bench and played their part against Longford. He believes Derry can retain the trophy and admits he's been hugely impressed by the progression of some of the younger players in the squad. "The team did well and it was a good result. We're into the next round and we're the holders of the cup so we want to go as far as we can and try and win the cup again. "We had to show them respect before the game. We saw they made 11 changes but we still needed to show them respect. The lads coming in obviously wanted to show their manager they're good enough to get in the starting XI for their next game. "It was a tough game at the start. They were passing it about and we were getting the run around a bit. But once we got the first goal, it was a very good goal by Junior a nice finish, we needed to get the next and the one after that killed the game. It was a good win. "The young lads who came in, in my opinion having seen them last year, it's like new signings. Aidy Delap, Conor Gormley Evan Tweed, Shane McNamee - they're like new players. They've got a spring about them and are looking really comfortable in and around the rest of the first team lads. "They fitted in well tonight. It was good for them to get minutes and the likes of Gianni (Seraf). It was good for the lads getting back to claim a place for the next game."